With the Colorado Avalanche losing to the Washington Capitals tonight 4-2, the Nashville Predators are officially playoff bound. Fourth time seems to be the charm for Nashville, as they’ve had the opportunity to clinch a spot since March 28th. Of course, as you are probably aware, the Predators have gone 0-3 on their last three games, so it took Nashville’s former head coach to get the job done by knocking off the Avalanche. Whatever way, Nashville is officially in and since the Blackhawks won and the Wild lost, there’s a good chance the Predators will face either the Kings or the Ducks in the first round. It also looks like the Blackhawks and the Blues will face each other in the first round (if you care). It’s officially time to #StandWithUs, Smashville. Oh, and finish out the last four regular season games, too. Nashville, Tenn. (January 22, 2015) – The National Hockey League announced today that Nashville Predators rookie forward Filip Forsberg has been named to the 2015 Honda NHL All-Star Game on Sunday afternoon (4 p.m. CT, NBCSN). Forsberg – who was already slated to head to Columbus this weekend to participate in the rookie portion of the NHL All-Star Fantasy Draft presented by Draft Kings on Friday (7 p.m. CT, NBCSN) and the Honda NHL All-Star Skills Competition on Saturday (6 p.m. CT, NBCSN) – is the only rookie named to the Game. Forsberg joins defenseman Shea Weber, goaltender Pekka Rinne and the Predators coaching staff led by Head Coach Peter Laviolette in being selected to the 2015 All-Star Game, forming the largest Predators contingent ever to represent the franchise at the contest. Forsberg replaces an injured Evgeni Malkin, who is currently suffering from a lower-body injury. It is also interesting to note that Forsberg will be the only rookie taking part in the All-Star Game and he continues to lead all rookies with 40 points in 45 games. A gritty third period indeed. After a lackluster performance within the first and second periods, the outcome of the game in favor of Nashville looked pretty bleak going into the third period. Carolina, who were 12-24-4, were already up by one on Nashville and, even though that should be nothing for a team that is 25-9-4 should be concerned with, the Predators have a lengthy record of flunking against the Hurricanes. The Hurricanes jumped on the board with a powerplay goal at 17:25 from Eric Staal, his eleventh of the season for Carolina. Carolina managed to notch twelve shots on net, while Nashville desperately hunted for it, only tallying seven shots on net. The second period brought zero luck to either contender on the side of goals. Nashville came out with a bit more gusto this period, taking twelve shots to the net compared to Carolina’s five. Peter Laviolette must have sacrificed a rookie during the second intermission because the Predators finally hit the ice with some power in the third. Ryan Ellis (5) put the team on the board at 4:43 with a tricky slip behind Cam Ward’s back. Viktor Stalberg picked up his second assist for the season – his first one gained just last Saturday against the Kings. Carolina would regain the lead at 8:14 with a powerplay goal from Justin Faulk, their second of the night. A little over two minutes later, Mike Fisher would tie it once again for his sixth goal of the season. Colin Wilson (12) and Filip Forsberg (24) tally the assists. 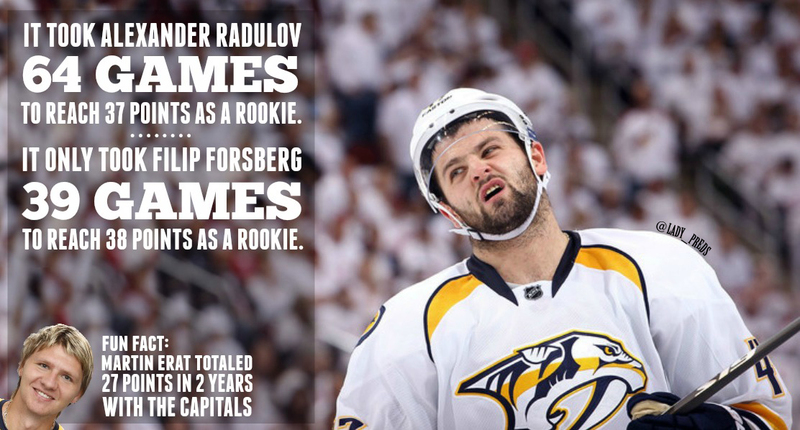 Noteworthy: With his 24th assist, Filip Forsberg has now surpassed Alexander Radulov’s Franchise Rookie Record of 37 points; Forsberg leads rookies in the league with 38 points, 14 goals, 24 assists, and 23 plus-minus points. If he isn’t a Calder contender, I will have no reason to doubt the NHL just hates Nashville. Roman Josi would nail the GWG at 15:17 for his seventh goal of the season, bringing Nashville back from a dismal first and second periods. Viktor Stalberg (3) and Eric Nystrom (4) would nab the assists. As the saying goes, “They don’t ask ‘how’ you won, but ‘if’ you won. Gritty wins in regulation still give you the two points.” — Someone says that. And, as news on the standings goes, Chicago (54) was blanked by the Colorado Avalanche last night, pushing Nashville (56) up two points. Though the Predators were already at the top of the Central Division, it’s still nice to push forward even farther from the Blackhawks. It is important to note that the Predators are also just two points behind the Anaheim Ducks for first in the Western Conference. The 18-15-6 Dallas Stars roll into town on Thursday, then Nashville is off to St. Paul to visit Ryan Suter and the 18-15-5 Minnesota Wild. Did that title catch your attention? No time to sugarcoat it tonight; oh no. I won’t spoil the fun by telling you what happened here; you need to read the meat and potatoes of the post. (Note: I wrote this paragraph before the meltdown). SCRATCHES: James Neal (lower-body injury), Victor Bartley, and Miikka Salomaki (sorry, kid). The Kings wasted no time lighting the lamp as Matt Greene sent a slapshot past Pekka Rinne just 32 seconds into the game. Mike Fisher quickly tied it up at 4:54 with a wrister past Jonathan Quick; his fifth goal of the season. Roman Josi (18) and Shea Weber (18) tallied the assists. Not even two minutes later, Colin Wilson would collect the deflected goal off of Matt Greene’s stick; his eleventh of the season. Viktor Stalberg collected his first assist of the season on Wilson’s deflection. Noteworthy: With eleven goals, Colin Wilson now has as many goals this season as he did all of last season. Birthday Boy, Ryan Ellis would tally his fourth goal of the season on the powerplay at 9:43 with a speedy slapshot past Quick. Mike Ribeiro (22) and Seth Jones (8) picked up the assists. After Ellis’s powerplay goal, Jonathan Quick was “quickly” pulled and replaced by backup Martin Jones. Replacing Quick didn’t help at the beginning of the second period, as Mattias Ekholm collected his second goal of the season at 2:16. Craig Smith (10) and Ryan Ellis (11) nab the assists on Ekholm’s goal. Nashville would continue pounding the Kings just a minute later, as newcomer Mart Arcobello picked up his first goal as a Predator at 3:57; his eighth of the season. Colin Wilson (11) and Paul Gaustad (8) are awarded the assists. The Kings would not stay down for long, as Alec Martinez flipped a wrister past Rinne to put LA within three. Dwight King would finish up the second period with another Los Angeles goal, a tip-in assisted by Jake Muzzin and Anze Kopitar. Olli Jokinen nailed his third goal of the season at 8:38 with a wrist shot past Jones, giving Nashville a 6-3 lead. Gabriel Bourque – who’s been awfully quiet – picks up his fourth assist along with Paul Gaustad (8). Dwight King picked up his second of the night at 17:59 with some assistance from Jake Muzzin. Alec Martinez managed to bring it within one, his fifth goal of the season. All Predators fans can relate. Noteworthy: The Predators were up 6-3 with two minutes left in the game. SIX-TO-THREE. Why are we having flashbacks to Monday against Chicago? WHY? 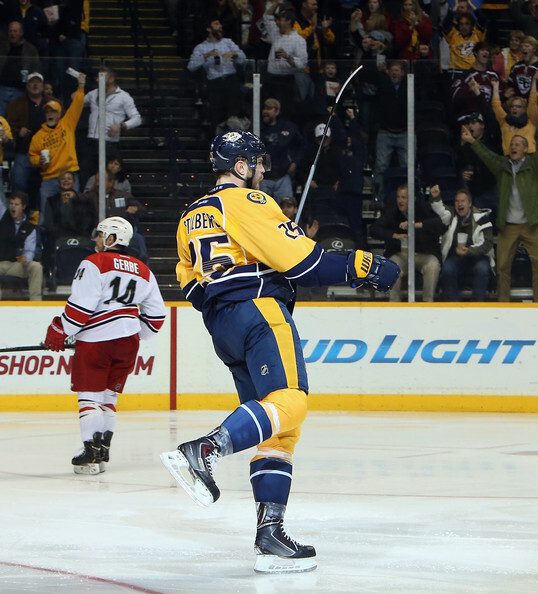 Thankfully, it only took Roman Josi (6) eighteen seconds into overtime to seal the win in favor of Nashville. Filip Forsberg (22) and Mike Ribeiro (23) collect the game-winning assists. Noteworthy: With this overtime assist, Filip Forsberg is now one point away from tying Alexander Radulov’s franchise rookie record. The Predators nab their first win of 2015 – though they tried to give it to Los Angeles – to give themselves a record of 25-9-3, but – as I write a lot – there’s not time for rest. Nashville has a bout with the leader of the Pacific Division, the Anaheim Ducks tomorrow night at 7PM. The Ducks rest just four points ahead of Nashville in the Western Conference, so it’s easy for me to say that a win in regulation tomorrow night would be splendid indeed. …And less stress on my heart, thanks. Okay, so heart attack relief comes in the form of the Central Division Standings.